Dr. Andria Wisler became the Executive Director of the Center for Social Justice in January 2013. She first joined Georgetown University in Fall 2008 as a Visiting Assistant Professor for the Program on Justice and Peace (JUPS) and served as Director of that program from January 2011 - December 2013. Andria received her Ph.D. in Comparative and International Education and Philosophy from Columbia University and master's in International Educational Development and Peace Education from Teachers College. Her research and teaching are in the fields of peace education, conflict studies, and international educational development, and her principal interest lies in the transformative potential of educational initiatives in post-conflict societies and for girls living in urban poverty. Andria’s commitment to social justice began as an undergraduate at the University of Notre Dame, and is a continuing thread through her work for social change in various parts of the world, including with farmers in Tanzania, youth in Turkmenistan, and teachers in Israel. After graduating from university, Andria began her vocation within education as a school teacher at an independent school, the Cornelia Connelly Center (CCC), which serves low-income girls of the Lower East Side, New York City. She now serves as an invited member of the Board of Trustees of the CCC. 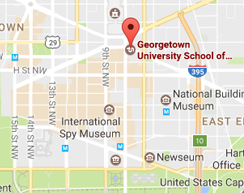 At Georgetown, Andria has been involved in many campus initiatives and programs. She participated in the inaugural group of Doyle Fellows, a campus initiative on inclusion and diversity, the Engelhard Initiative and, in the Fall 2010 semester, Andria was a faculty-in-residence in Georgetown’s Alanya, Turkey study abroad/community living-and-learning program. Due to her significant justice and peace pedagogical expertise, she was approached by Routledge to author an Introduction to Peace and Conflict Studies textbook. She has been the external evaluator for a 3-year Department of Education funded project at George Mason University on peace, conflict and justice curricula and pedagogy, a position that brought her to work in Liberia. Andria is currently co-editing (with Celina Del Felice) Peace Education Evaluation (Information Age, 2014), a first of its kind resource of 25 chapters that reviews the trends and challenges in evaluation of peace education, presents case studies of programs around world, and offers ideas for methodological innovations.